Flick watching as Steph kisses Marc after he presents her with an engagement ring. Tad apologising for kissing Elly and saying that they shouldn't have kissed. Dee informing Stu that there is a girl at the door and she claims to be his fiancée. Stu thinks Dione is kidding with him but she tells him to look for himself and as he takes a peek out of the kitchen he spots her but quickly retreats into the kitchen because he doesn't know what to do. Dee volunteers to see Tracey instead for him and makes her way to the front door and tells her Stu doesn't want to see her. Flick comes in with some veggies that require prepping but all the other employees shun her when she asks for a peeler. Eventually Marc comes over to find out what the problem is and Flick mentions that everyone are shunning her because she knows Marc and obviously think she got her job through favouritism. Marc tells her to ignore them and tells her to stick it out when she wants to go back to the front desk. Karl is telling Susan about a dream he had where Elly was his boss before he starts moaning to her about Darcy and suggests there is a defective gene in her family! Susan tells him he is a drama queen as Elly comes out of her room dressed like she is going to a nightclub instead of to work. Karl tells her she needs to tone it down and she heads back into her room. Stu thanks Dee for getting rid of Tracey as Tad arrives mentioning he saw someone who knows Stu from the country and Tracey promptly walks in at his back. Karl catches Elly reading Tad's file and reminds her about confidentiality. She moans at him for not giving her enough to do as Darcy phones in to tell Karl that he isn't coming in so it is just them. Dee catches Tad listening in on Stu and Tracey's conversation and promptly throws him out of the house! In the kitchen, Tracey wants to know why Stu left and he informs her that her having an affair with his best mate was the clincher before leading her to the front door and telling Tracey to leave. Before she leaves however, she gives him her contact details for Erinsborough and asks him to call her. Flick finishes prepping the veggies but is still getting the cold shoulder from everyone when she asks for a pot to put her carrots into. Marc comes in and danglies her for cutting the carrots on the surface instead of using a chopping board. He hands her a pot and tells her to look harder the next time as the other employees have a little smile to themselves. 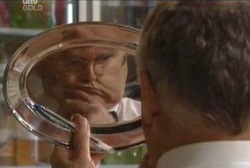 Harold looks at his reflection in a plate as Susan comes in and asks who the lady is. Harold is all coy and he asks her if she finds him portly. Susan wriggles her way out replying as she spots Elly and heads towards her, as she sits with Tad, before telling Elly that she's bought her a sandwich and she can eat it at her desk. Dee clams up as Stu tries to get friendly because she is concerned about Tracey. Stu tells her he feels better for saying what he did to Tracey as he hugs her. Karl shouts at Elly for playing with medical sticks that should be sterile! She moans about the lack of real work and Karl gives her some more filing to do even though she is fed up doing it. She earns herself some brownie points from Karl though as someone claiming to have hurt their leg limps into the surgery and Elly tells him the patient is faking her injury. Dee fills Tad in with the info he tried to listen into earlier with Stu & Tracey, before leaving just as Tracey arrives. She sits down and asks Dee if she hates her. Dee says she has no opinion on her and Tracey informs her Stu will never find a better person that her. Dee replies that she's talking to the wrong person and Tracey tells her she isn't giving up until she has Stu back even though Dee thinks she is wasting her time. 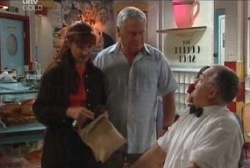 Tracey begs her to put a good word in for her as she can't live without Stu. Flick is getting the tables ready now as Marc comes in and asks how the atmosphere with the others is now, and so finding out he bollocked her in front of the others so the others would treat her better. She tells him that she almost walked out and wishes he had the same choices too but hasn't because he is the boss' son. Karl is telling Elly that the person faking the ankle injury has a psychological injury instead as Lou enters. They enter Karl's office and Lou hands over an envelope with details of Ian Conway and reassures him that he'll keep quite to Susan about what he is up to. They almost get caught though as Elly enters the office just as Karl is reading the info. Flick and the others are busy setting up the tables when Tad calls in but he thinks she'll get into trouble for talking to him while she is busy. Flick replies that it is all cool now and shouts Marc over to be introduced to Tad. He is a bit surprised to see Steph's fiancé as Tad imagined someone different. Flick announces she wouldn't get married so young, as she still has things to do with her life and doesn't want to compromise. Marc asks then if Steph and he are doomed and she replies no, because they both have settled into life, have already got what they want and besides Steph is so ready for marriage. Dee arrives home and Stu asks her to pick somewhere they can to go to celebrate his freedom. She isn't keen on celebrating as she thinks Stu isn't over Tracey and he asks if she is over Darcy. Dee clams up at this and turns it back to him. Stu goes over to her and half hugs her and says that Tracey is out of his life, he now has her and that he's never been happier. Dee replies that he doesn't have her because she is convinced that he isn't over Tracey. Susan spots Elly doing CPR on a dummy and quickly tells her off but Karl reveals himself (he was behind the door out of her view) and says that he is giving Elly a follow up lesson on CPR given the great job she did with Darcy. Susan is then surprised to hear that Elly is staying on to help with the evening surgery. Marc thanks everyone for their work and goes over to where Flick's is and she thanks him for what he did to help improve the atmosphere earlier. She then goes onto say that she is over him (for making the pass at him) and is wrapped about him and Steph. Stu lets Tracey in and thanks him for calling her. She thinks this is him wanting to get back together but Stu says that it is over because he's found someone else and that she means a lot to him. Tracey is still delusional and Stu repeats he is over her but she is insistent that she isn't going back to Oakie without him. While Karl goes after a patient who left before making an appointment, Elly tidies up Karl's desk and spots the envelope Lou dropped round earlier and opens it. Karl comes back in and sees her reading the letter and quickly says that it is private but she twigs it is about her father and wants to know what is going on.